I am the parent of a teenager. A legitimate, literal teenager. Jake turned 13 today at 3:21 am. Our path to the teen years has been full of love, new experiences, firsts for me as a parent, and adventures. Some adventures have been exciting and invigorating. Others have caused us both discomfort, but we’ve grown along the way. As Jake grows and starts having more of his own private experiences, I have to let go. It is bittersweet. I don’t want to see him hurt, or upset, or failing…but I know that it’s my job as a parent to let him experience all of those things…because that ultimately is how we grow and figure out what we want from life. I want to shield him from the pain of rejection, the angst of failure, the hurt of loss. And yet, when I look at my life, my experiences, it was in those terribly uncomfortable moments that I grew. It wasn’t easy. It caused my anxiety to flare, and yet, with my mom guiding me ever so gently with some advice, perhaps some nagging, and lots of love, she let me work through it. Often, I had a much better idea of what I wanted and needed in life once I was on the other side of the experience. I know that the teen years are going to be challenging for both of us, and likely, in varying ways. I promise to be his shepherd, his beacon, to help get him through the storm. I hope he understands that. My actions are always inspired by concern, love, and the knowledge that independence is our endgame. Happy 13th Birthday, my Jakey-P. I love you. An unsure first time mom with her bundle of joy. I feel as unsure as I look in this picture, as we embark on teendom. 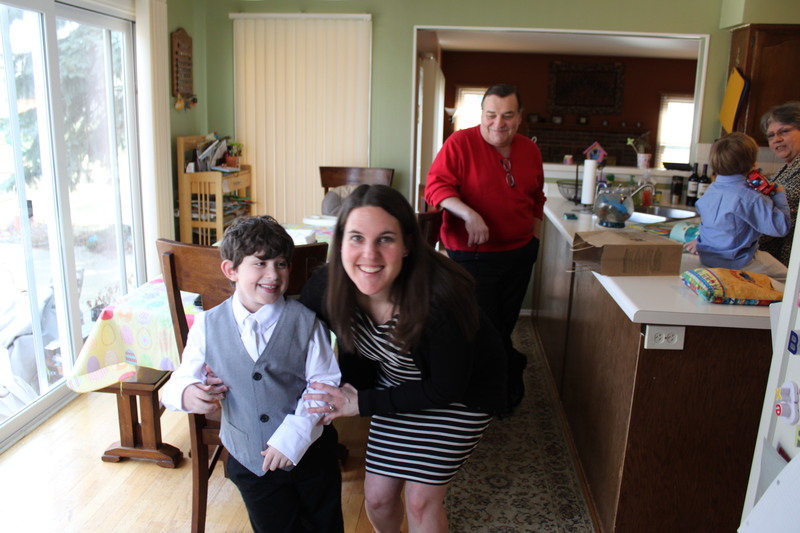 Last fall I wrote a post regarding my struggle with the fact that Tate wouldn’t make his First Communion with his class. I was a little sad, and a little disappointed. I spoke way too soon. This year we have seen tremendous growth. Tate’s language skills have really blossomed. He is much more involved in the actions and surroundings around him. He has developed some astounding coping skills. We have our bad days, weeks, and stretches, as does anyone, but overall, our kiddo has made some impressive strides. I dare say, he has really come into his own. Along with all of this glorious progress, we have noticed that during Mass, Tate is much more aware of the routine. He follows along, and knows when to sit, stand and kneel. Whether he joins us all is another thing, but you’d better believe he tells me when it’s time to do each action. He knows when we sing. He knows when we pray. He knows when we make the sign of the cross and say “Amen”. He also knows when he needs a break from all of the action, which is so huge, that I really don’t need to say it. He will say, “I need to go to the playroom” or “I need a drink”. If we ask him if he wants to go for a walk, he will let us know if he does. Again, super-duper huge. He is also an active participant in our church’s special religious development class. (SPRED) In that class, which meets every other week, they meet with a one-on-one catechist (someone who leads them in our faith). They read a passage from the Bible. They talk about a good thing from their week. They do special activities. They sing. They dance. They share a meal. It is fantastic. 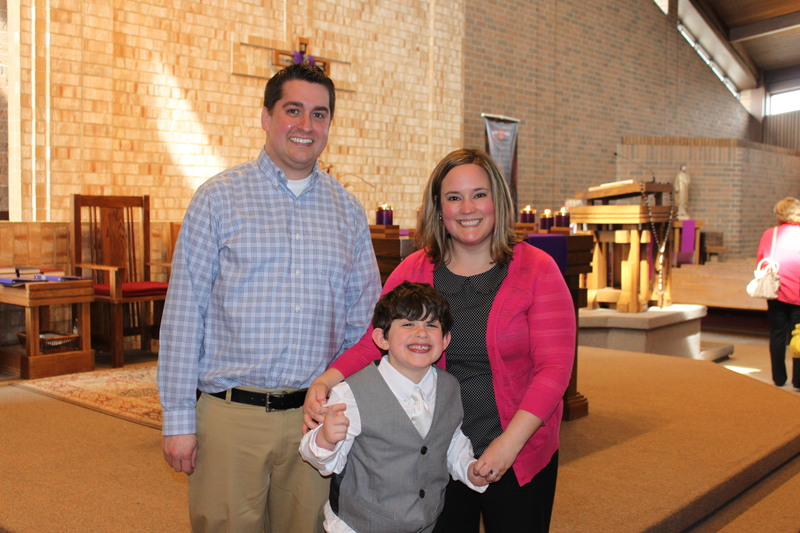 About a month and a half ago, I asked his catechist about a timeframe for Tate’s First Communion. I know that the SPRED children often don’t follow the same timeline as the “typical” classes do. I mentioned how Tate is making a rough sign of the cross, how he follows along in Mass, how he keeps asking if he’ll be making his First Communion because he’s going to be 8. 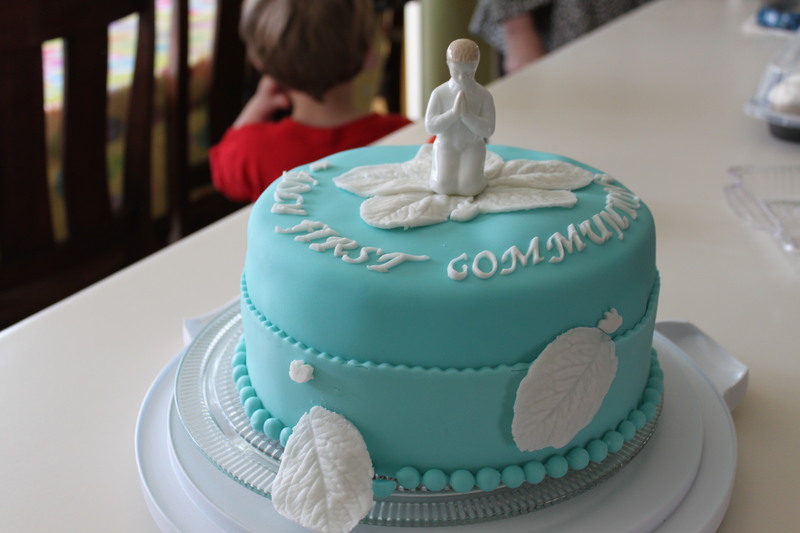 His catechist called the next day, saying that between my report of his progress in his faith at home, and what growth they’ve seen in SPRED, that they felt he was ready for First Communion. I was ecstatic. Again, Tate has proved that he should not be discounted. That he should not be marginalized. He is right there with his peer-age group. 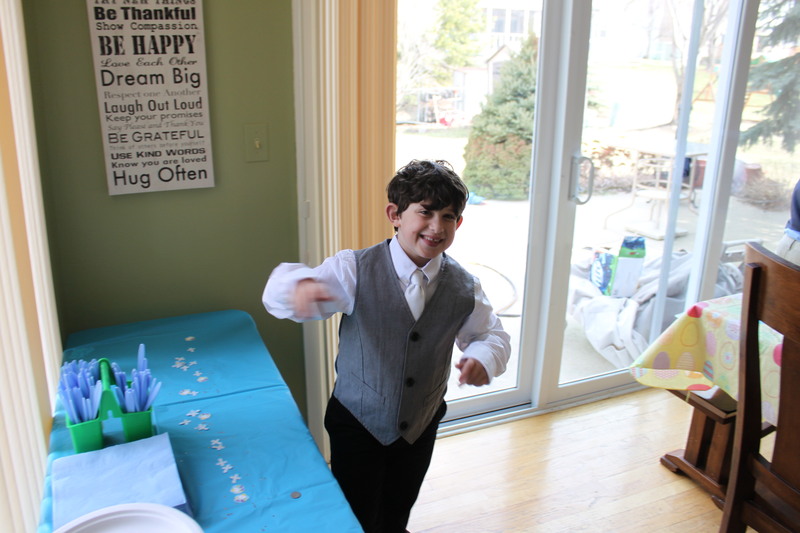 In fact, he made his First Communion before other 2nd graders!!! He was so proud. The smile on his face when we told him that he was going to make his First Communion, oh, how I wish I could capture it on film. It lit up his whole face. Even his eyes and ears and nose were smiling. For him, for us, it was magical. This past Sunday was his big day. We had practiced how he should hold his hands. We had practiced what he should say when the priest said, “The body of Christ.” We had practiced how he should make the sign of the cross. He was as ready as he could be. Sunday morning we had a special breakfast of cinnamon rolls and lemonade. Well, at least the boys did. They all showered and put on their Easter best. Tate willingly put on a collared, button-up shirt and a tie. A TIE!! He wore pants that had a button and a zipper. He wore dress shoes. He knew it was “only for an hour”, and then he could wear his comfy clothes. He also knew his clothes were special. We got to church and our entire family was there to celebrate with him. His godparents were there. His grandparents. His cousins. His aunts and uncles. Everyone was ready to support Tate in his growth in his faith. It was spectacular, and caused this momma to tear up, just a wee bit. He struggled a little with all of the attention. He was a bit anxious, and ripped off his name tag. Once our family was seated, Tate and I went back into the gathering space of the church. We stood with his fellow communicant (another child from his group was making his First Communion, too) and with his catechist. He looked for some sensory input by pressing his chin into my arm. After two squishes, he said he was okay. I told him I was going to go sit in the church, and he said, “Bye, Mommy. See you later.” And that was that. He walked into church with the rest of his SPRED group. He sat quite well with his catechist during an ENTIRE Mass. It was an hour. And he sat the entire time. Without needing any escapes out to the gathering space. HUGE!!! He danced with his whole body when the SPRED group sang the Responsorial Psalm. He just exuded happiness. When it was time for his First Communion, they called Hubz and me up to the altar with him. 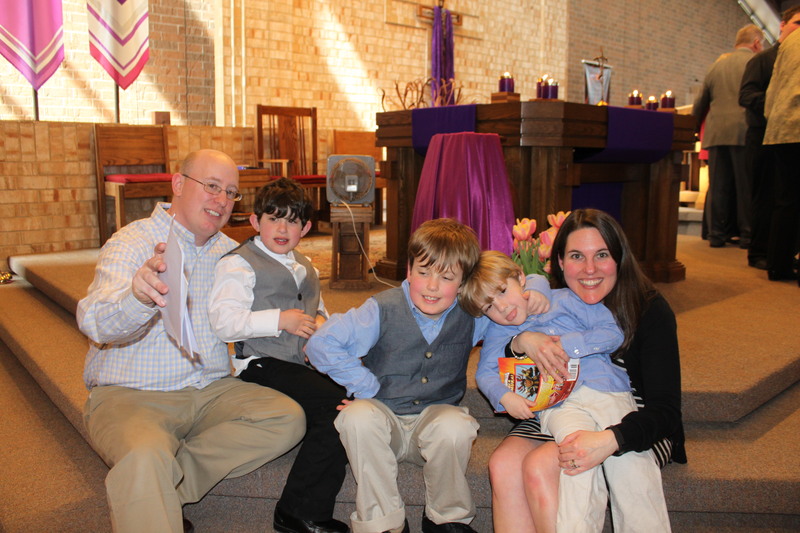 We stood around the altar with Tate, his catechist, and the other boy and his family. Our priest talked about how wonderful it was to see Tate and the other boy grow in their faith. 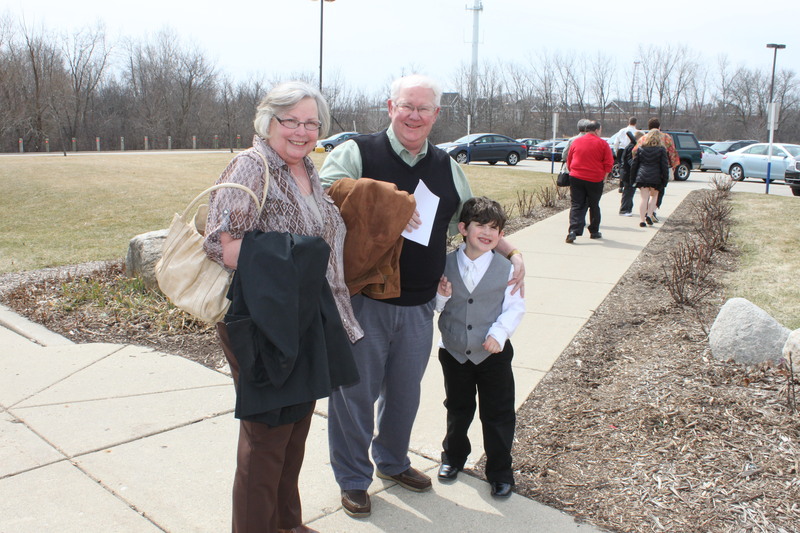 He applauded us and the other parents for continuing to help our children grow in our faith. It was all I could do to not ugly cry up there. I was so proud. My chest was bursting. Tate took Communion like he’d been doing it for years. He was calm. He wasn’t overly fidgety. I wasn’t chasing him around the altar or worried about him knocking over candles. He was phenomenal. He was ready. So ready. He made his First Communion and calmly went back to his seat with his catechist. Hubz and I were beaming with pride. Our kiddo…the one who has struggled greatly in all things, did it. He not only did it, he did it well. I couldn’t be more proud of my son. He constantly works and tries and overcomes. He proves to us over and over again how much he is capable of doing. I am blessed to be his mom. Tate in his comfy clothes. 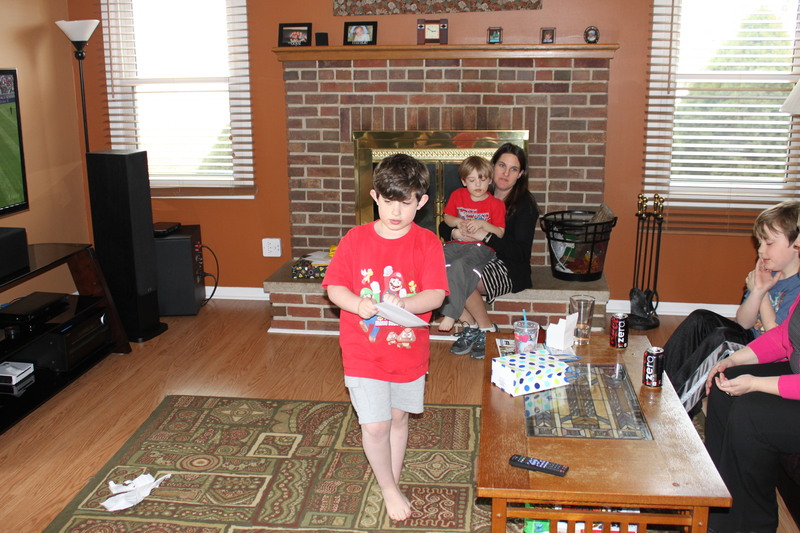 “You know you live in the Midwest when…” your kiddo puts on shorts when it’s 58 degrees outside. Tate’s cake…made by Hubz’s mom. Awesome, right? About as good of a family photo as we’re going to get. A dapper Tate…stimming with a plastic knife because, well, why not? Today was a big milestone for us. My “baby” went to preschool. Cole is a preschooler. When did that happen??? He’s there 2 days a week, 2 1/2 hours each visit, but those are 5 hours I have never had to myself before. 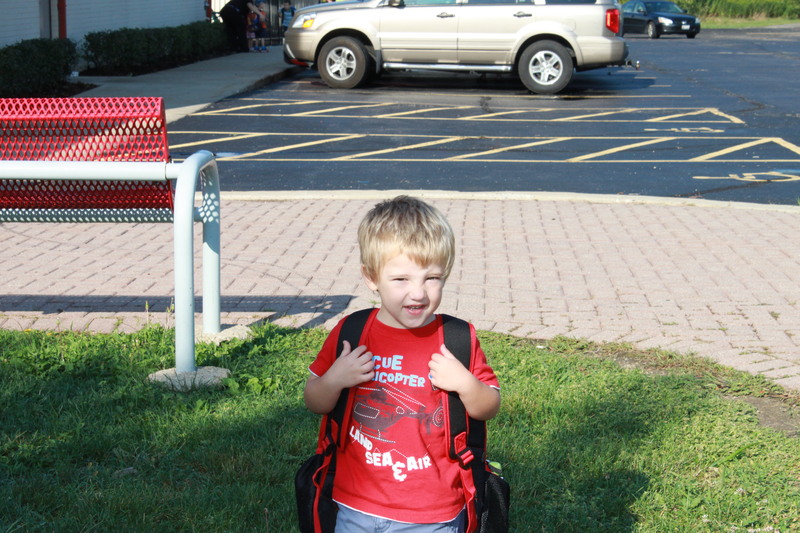 As I drove him to his first day, Cole chattered on and on about going to preschool. He was excited to see “his” kids. He was bubbly and chatty and said he wanted to learn more “stuffs”. I took his picture in front of the school. He kind of smiled for me. 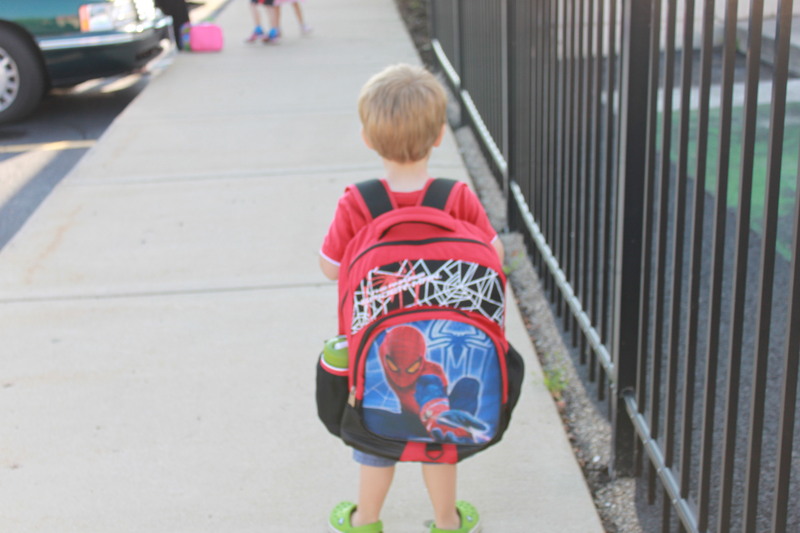 He was impatient–behind the door was his long-awaited preschool class. He could not contain his excitement any longer. We walked into the building and Cole helped me put his items where they belonged. He did it without me even having to tell him–he just followed what everyone else did. He zipped up his backpack. We walked into the classroom. He took a big look around, got a huge smile on his face, and waved to me, “Bye, mom! See you later!” Huh. That was it. Ok. I left, smiling as I did. Another mom mentioned that she was going to likely break down in her car, once she was out of eyesight. She was sending her baby to school, too. I didn’t feel any tears coming on…just a sigh of relief. The moment, for me, was bittersweet…emphasis on the sweet. I had a little tightness in my throat and tug at my heartstrings as I thought of my youngest child in a classroom–beyond my control. 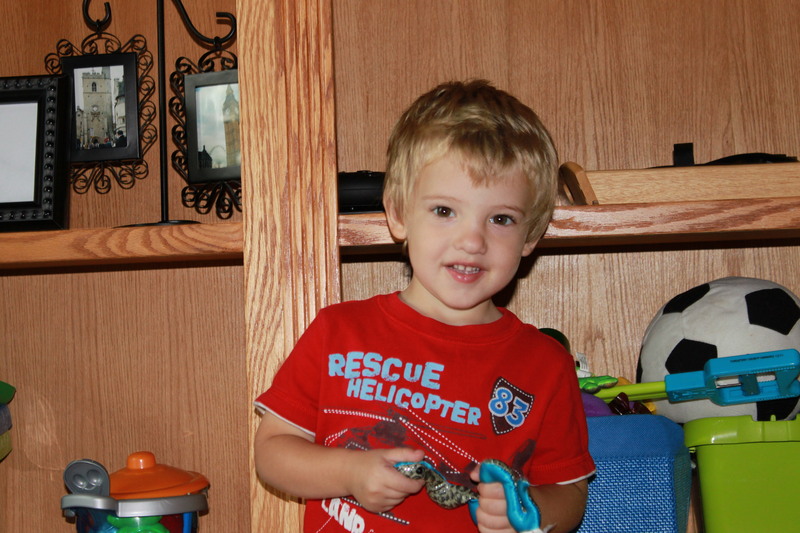 It made me think about how much he is READY for preschool. How excited I am for him to learn about letters, numbers, colors, shapes, writing, math, reading, and playing with friends. I smiled as I thought of him trying to rule the roost as he does at home…and how he’s going to have to learn to share and take turns with his peers. It will be an adjustment, but he can handle it. He’s ready. I flashed back to April 2009. We sent Tate to school, on a bus. For 2 1/2 hours of preschool 5 days a week. At age 3 and 3 days. Tate didn’t talk. Tate had an incredibly difficult time receptively understanding speech. He had sensory needs that were off of the charts. He couldn’t use the bathroom by himself…in fact, he was still in diapers. He shied away from peers, preferring to sit near teachers and adults. He was incredibly dependent. He couldn’t follow directions. He had no idea how to navigate the world. And yet, we sent him to preschool. Because it was what was needed. It was for his benefit. I cried the entire day at work in my cube..until his teacher called me to let me know he had a fantastic day. If we could do that, I could definitely send my 3 year-2-months-but-acts-like-he’s-nine-year-old to a preschool where I can drop him off, pick him up and ask him how his day went–and know that I’m getting a fairly accurate representation of his day from HIM. We got his “Cole had a great first day” certificate and he proudly put it on the refrigerator next to Jake’s spelling test and Tate’s latest assignment from school. He was beaming as he did it. If you’re wondering what I did with my 2 and a half hours…well, it wasn’t very thrilling, but it was wonderful. I ran errands that are impossible to do with a 3-year-old. I sat at my kitchen table with a glass of water and read the morning paper. I searched the basement and the family room for a lost library DVD (to no avail), but didn’t have anyone “helping” me do it…It was glorious. And I’m looking forward to the next 8 months of this new freedom.